The developers of the open-ended RPG The Witcher 3: Wild Hunt describe their bold creation as a “morally indifferent” fantasy world, but it’s difficult to illustrate the true breadth of that claim. The world of The Witcher 3 is violent, desperate, dark, beautiful, and palpably old. It teems with quests and hidden dangers, alongside gritty heroes and the wrongdoers to match them. Playing Wild Hunt on PS4 for the first time, its world came to life in unexpected ways, but delivered a consistently rewarding introduction to a rich tale. Those new to the Witcher series need not slink away, overwhelmed — The Witcher 3 is designed with you in mind. It begins with a prologue that deftly establishes the important characters and the stakes of the conflict around them. You play as a slayer of monsters — a Witcher — one in a long line of highly-trained, mutated beings that seek out and destroy threats against humanity. This background has gifted (or cursed) hero Geralt of Rivia with an unnaturally long life, and a set of skills suitable for his profession. At the onset of The Witcher 3’s story, Geralt and his old master Vesemir are tracking a mutual friend (and in Geralt’s case, former lover) named Yennefer of Vengerberg. This raven-haired sorceress sent a cryptic letter to the pair and little else, leaving Geralt and Vesemir to track her down on horseback. 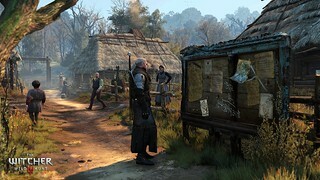 This scene quickly reveals the open world, which feels almost impossibly alive as Geralt and his mentor ride down dirt paths and weave through rich forests in search of clues. Peasants tend to their work, children dash through villages, and birds take flight from rustled trees. The attention to detail is admirable, and that extends into Wild Hunt’s combat system. Danger lurks in all corners of the world, and comes in forms both human and otherwise. At the start of Wild Hunt, Geralt is armed with swords of steel and silver — best used to dispatch men and monsters, respectively. When in combat, Geralt can unleash light and heavy strikes, dodge in any direction, and parry incoming attacks. A perfect parry will result in a riposte (counter), giving Geralt a temporary edge over his opponent. But Witchers have much more than blades to their name. Geralt’s order has a basic understanding of magic (simple gestures called “Signs”) and alchemy, both of which have a tremendous impact on combat. At first, Geralt has access to five Signs that can serve both offensive and defensive purposes. Quen, for example, forms a protective shield around its caster that can absorb one attack. Igni, on the other hand, casts a spray of fire before the Witcher in a glorious display of smoke and embers. Geralt can also utilize a variety of potions and bombs to complement his swordplay. But keep in mind that reaping the benefits of alchemy requires ingredients, which can be scavenged from the world or purchased at one of many shops or inns. The PS4 version of Wild Hunt looks gorgeous, whether Geralt is spurring his horse Roach through sweeping fields or just relaxing at the pub. The characters — including minor roles — are expertly written and acted, which bolsters an already impressive feeling of authenticity in the game world. 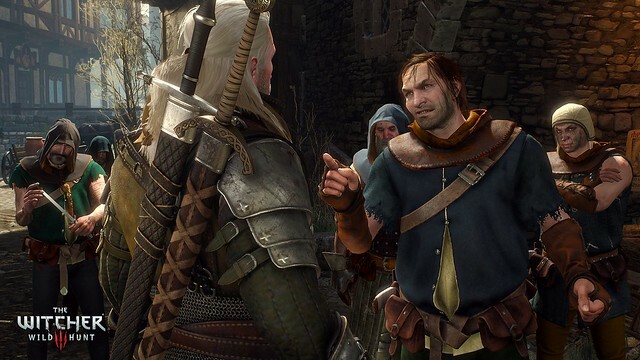 In fact, some of The Witcher 3’s best moments come from random conversations between Geralt and the villagers, which give players several dialogue options for a branching narrative. 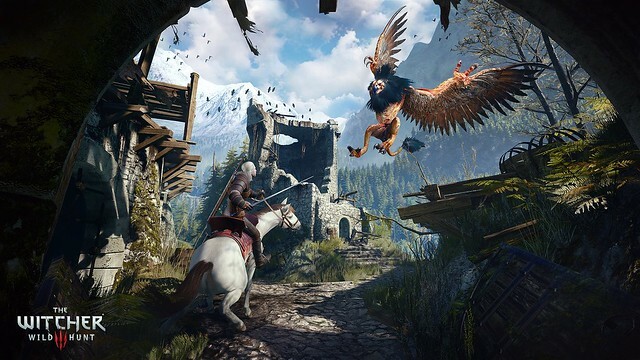 The team at CD Projekt Red has created something quite remarkable with The Witcher 3; a fitting endeavor, given the quality of the previous two adventures and the legacy that Wild Hunt will follow on May 19th. I can’t explain how much I am excited for this game,its as much anticipated for me as The Last of Us and GTA V was back in time. Definitely agree! Eager for this one to launch! That game will truly deliver! I’ve never played a Witcher game before but this game looks incredible, looks to be a day one buy for me. Yeah, I had a blast playing it. Fantastic intro. This is looking like my next favorite RPG, I’ve been wanting another huge world to spends days in! awww i really want play this game so bad. May 19th give me almost 4 months away to wait for it and play it. Are there any plans to move Witcher 1 & 2 to PS4? Maybe I missed the announcement, but I know I’d buy a collection. I don’t have any news to report on that front! Game looks surprisingly good…liked every gameplay released.I’ll probably get Witcher 3 later on. While The Witcher 3 is not available, I’m enjoying the books. They’re really awesome. I just met Ciri there. Sweet! I need to look into those books. They seem like they’re right up my alley. Never played a Wither game but this looks like it could be several dozen hours of fun and exploration. I loooooooove me a good RPG will have to try this out. Yes, it definitely has an impressive opening. So excited to explore the unique world of The Witcher 3! Sorry to sound like a sheep, but this game has me very excited. Nothing wrong with being a sheep. Please bring remastered versions of The Witcher and The Witcher 2 to PS4! It would sell very well. With that said, I am looking forward to playing The Witcher 3 on D1! I’m a big fan of the Elder Scrolls series. The sixth entry is probably a long way off still. Do you guys think W3 would deliver something similar in scope and gameplay? This game looks really cool but I cant stand the way he attacks, all spinning around like a idiot with each attack. So how come, at least to my knowledge no actual footage of the PS4 version of this game in action has ever been released? Does Micro$haft have some kind of “parity” rule in place where they don’t want the PS4 version shown because it’s higher-resolution and better looking? Or are CD Projekt Red getting some $$ under the table from M$? After all the XB1 is getting a limited edition with more extras than PS4. Will I need to play the first two Witcher games to know what’s going on in Witcher 3? The Witcher 2 was one of my favorite games last gen, can’t wait to play this on PS4. @ BlaqMagiq24 I suggest playing the first two or at least watching the cutscenes online, your going to be really lost in terms of story and characters. The game has so much lore, if you really want to get the most of this I suggest revisiting the last two if you can. I liked Witcher 2, but found it’s story fairly forgettable, so I’m only mildly interested in Witcher 3 at this point. However, I really respect CD Projekt for what they do and what they represent, so I wish them all the success in the world. For their sakes, I hope this game is a massive success. Haven’t played a Witcher game before, but this is easily one of my most anticipated games of the year. The devs approach to DLC is just icing on the cake.. And it drops on my b-day! i’m new to the series but excited to this is coming to consoles so i can play too! I haven’t played The Witcher series before but have seen my brother play them. I am glad the new one is coming to PlayStation…it’s nice to see some awesome RPGs coming out. With Dragon Age Inquisition that I am no where near finished with lol and this and The Elder Scrolls Online and countless others coming f it’s already shaping into an amazing year. Too many games…never enough time. I truly enjoyed The Witcher 2: Enhanced Edition on PC. Seeing that The Witcher 3: Wild Hunt is coming to the PS4 makes me very happy since I don’t have to upgrade my hardware to play the game. For those of you have have never played a Witcher game, think of a fantasy setting similar to Elder Scrolls, the combat of Fable and the dialog choices of Dragon Age. However, this game is going to be even more massive since its going to be an open world game. This is also the first time combat on horseback is coming to the series as well. When you think of the main character, Geralt of Rivia, think of a supernatural warrior who uses regular swords to fight humans, silver swords to fight demons, has the ability to detect demons and enhance his capabilities through creating and digesting certain potions that could potentially kill and average human. From an art design perspective, he has certain things about him that remind me of Vampire Hunter D and Alucard from Castlevania: Symphony of the Night. The only thing I am sad about is the fact that this game is the final chapter in The Witcher series. I personally hope CDProjeckt RED has a change of heart and brings us more games in this series. I dont know much about this game but it looks fun, ill get it. I have now pre-ordered this twice, thanks to the moved release date. Beyond excited for my first venture in to the world of The Witcher! March is shaping up to be delightfully painful to both my Wallet and Family Time. Danger! I already pre ordered it twice i gotta cancel disk pre order as i got digital pre order as soon as it was up on the psn store best game of the year imo along with uc4 those 2 are the ones im most excited for more so than any other games releasing this year . Aside from f2p games Snow and KUF2 . I know witcher 3 will have over 100 hours of gameplay with 16 free dlc releasing each week 1 a week til they done with free dlc and then onto buy the paid dlc when they have it . So i should get over 200 hours of gameplay from this game as i intent to plat this game do several run throughs of this game will keep me busy for at least 2 whole months if not more. Lets get the party started . Now i just have to play the waiting game to play it. So amped and excited for this game ive never had my expectations for a game set so high . Long live true pure RPGs and the genre . When will it be released…any date? I recently bought the first on steam and the second on the 360 and loved them both. Someone here suggested bringing both to ps4 and I couldn’t really see that happening for the first game, the controls and the feel of the game is very PC, it would feel incredibly strange on a controller, unless they completely revamped the game. But if they brought the second game to the new systems I would easily purchase it again. I would love to see Witcher 1 on Vita and Witcher 2 for PS4. Not sure if Vita could handle Witcher 2, but it would be perfect on the go. I am pumped for this game and love that they don’t charge a cent for the dlc. The game is only 42 bucks at bestbuy with gamersclub and they are offering a 10 gift card if you preorder. I am not sure if the dlc is really dlc or just something that could be put in the game at launch but I am very excited for this game. Hopefully the combat will be as good as the game looks. I would never buy 1 game for 110 dollars unless it was a neo-geo game. 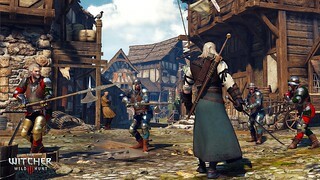 Really loved The Witcher 2… But This one looks like a piece of art already.. can’t wait to get my hands on it. I read that ‘The Witcher 2’ was more linear than it was open world. Does the same apply to this 3rd installment or is it more of a Dragon Age Inquisition style? Like linear but still mostly open world. Now I’m gonna hit the books, I need to be ready for this epic adventure, and since I missed the previous games I think that will do more than any video playthrough. I went to pre-order this game on PSN and noticed the price went back up to $59.99. The description below still states that it will be 10% off until it releases? Anyone know why the 10% discount isn’t showing up anymore? This game will be amazing!! I’ve played Witcher 1 and 2 both great games. I’ve been waiting for the sequel , and it as if your part of the game when your playing it . I’m excited. The 1st game graphics were was ok, and the sword play and fighting was fun. The game was a little confusing but I had to finish it. The second games graphic was beautiful, but the sword play was harder. And the world was easy to navigate . For a sequel this was a great game and they left me wanting more . I’m looking forward to playing this game. To the guy who claims the PlayStation 4 version looks better than Xbox one, it has been confirmed both versions roll run at 1080P @ 30 frames a second. I go to school at The Art Institute, At a field trip press event both version were on show and both looked the same. Thor, one of the tech devs confirmed. Apparently the only reason Xbox one is getting extra content with the collectors edition is because the publisher feels there is a bigger install base on Xbox since the Xbox 360 got The Witcher 2. No extra money or favors were tossed their way like Sony did with Destiny. That said, can’t wait. I’m getting it on Xbox One only because there was still a few Collectors Editions available for preorder. This game is awesome and have played the previous PC versions. I have to ask…. With the way games are going recently , why no online play?